In 1912 Garstin held a summer sketching party at Guémené sur Scorff in Brittany. One Sunday in early July, the party 'suddenly came upon a tiny church by a couple of farmhouses, very primitive and simple. Just as we arrived the procession started, all peasants, some men and women carrying banners, and a few little red acolytes attending a priest in a yellow cape ... it was all wonderfully pictorial. Then they filed back again ... and came to the back of the church, where there was a great pile of brush wood. The people stood in a circle and the yellow robed priest set fire to the great pile ... the effect was really delightful and pagan. It was St. John's Eve and these fires came down from the Druids, tho' the good people did not know it. I stood on a cart and made a scribble ... but I cannot help thinking it might be a jolly subject for a fairly large picture (private correspondence to Alethea Garstin, the artist's daughter). 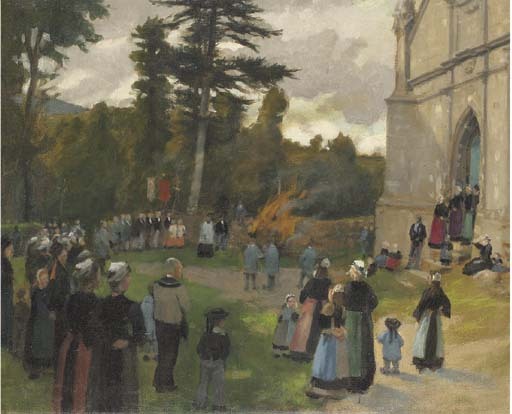 In the following year, Garstin exhibited A Breton Pardon at the Royal Academy. This painting was not illustrated, but the present work would appear to be a smaller version of the same subject.